Walnuts are considered to be a superfood! So when you serve a pile of walnuts with our SUPER homemade beetroot spaghetti pasta, then you have a ‘super-super’ food. 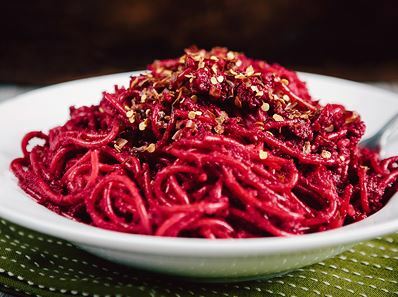 This recipe for beetroot spaghetti with walnuts and sun dried tomatoes, came about because we after making up some sweet potato leaf and walnut pesto, we still had some walnuts left over. Beautiful colour! 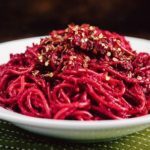 We hope you give it a go because beetroot spaghetti with walnuts and sun dried tomatoes is so easy to put together, you will have a stunning looking meal on your table in less than 30 minutes … once you have roasted those beets. So do a few more than you need and keep them in the fridge because you will be cooking this dish up again! Preheat oven to 400F. Drizzle beets with olive oil and wrap beets and garlic cloves tightly in foil. Roast until very tender, approximately 1 hour. After removing from oven, remove foil and let cool slightly. Carefully peel beets and coarsely chop. In a food processor, combine roasted beets, garlic, remaining olive oil, walnuts, and tomatoes. Pulse until smooth and creamy, adding reserved pasta water as needed. Season with salt to taste. Toss pasta and beet mixture until well combined. Sprinkle with red pepper flakes and serve with a scoop of ricotta on the side.